Ten thought – provoking episodes bring a fresh perspective to Scotland’s past and challenges many of the perceived notions of Scottish history. Using the very latest in historical research A History of Scotland is a sweeping and insightful chronicle of an often turbulent, but continuingly fascinating nation. Episode 1 – At the dawn of the first millennia, there was no Scotland or England. 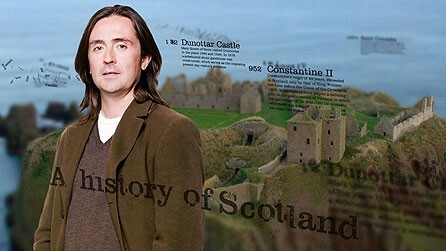 In the first episode Oliver reveals the mystery of how the Gaelic Scottish Kingdom Alba was born, and why its role in one of the greatest battles ever fought on British soil defined the shape of Britain in the modern era. Ten thought – provoking episodes bring a fresh perspective to Scotland’s past and challenges many of the perceived notions of Scottish history. Using the very latest in historical research A History of Scotland is a sweeping and insightful chronicle of an often turbulent, but continuingly fascinating nation.